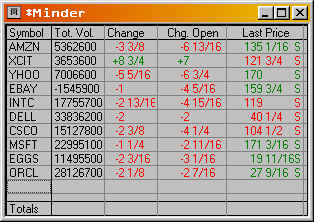 Market Minders are used to monitor stocks. You can enter your favorite stocks and they will continually update in real time. Red means the last sale was a down tick and green means the last sale was an up tick. Princeton's course will show you how to drag and drop the stocks from the market minder to the market maker window as well as how to link all your charts together, so they all update at the same time. There is much to learn in this business of daytrading. courses prepare you with a quality education.